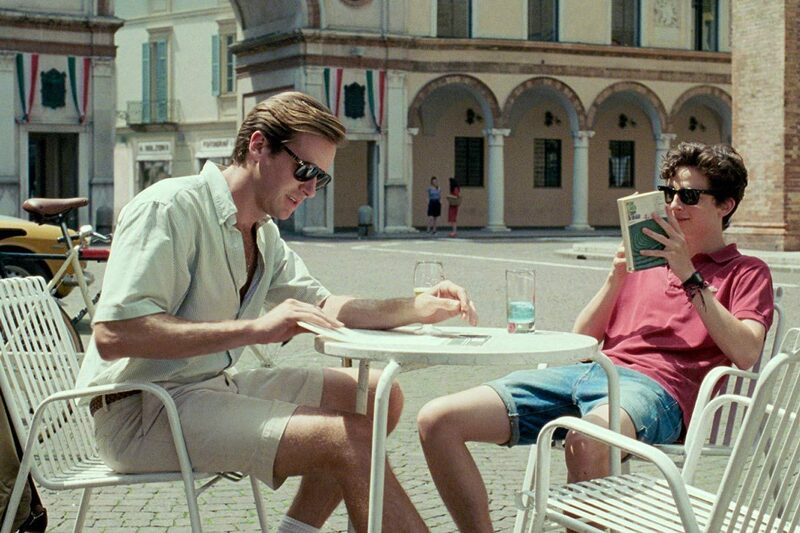 Although it was only released last year, Call Me By Your Name is well on its way to becoming a style reference, in large part thanks to the attire of Armie Hammer’s character Oliver. Armie Hammer and Timothée Chalamet star in Call Me By Your Name, set in the north of Italy. Set in the early 1980s in the Italian countryside, and coupled with director Luca Guadagnino’s strong visual signature, coming-of-age drama Call Me By Your Name was always destined to be a visual feast. Characters Oliver and Elio, played by Armie Hammer and Timothée Chalamet respectively, forge a relationship against a backdrop of over-burdened fruit trees, al fresco dining and 16th-century Italian architecture. Costume designer Giulia Piersanti is responsible for the styling in the film, which acts as an extension of this leisurely aesthetic: shorts skim the upper thigh, shirts are oversized and unbuttoned and shoes, if present, serve a purely functional purpose. Although the precocious Elio has his own boyish charm, it's Oliver's preppy style that steals the show. Oliver is a college graduate visiting from America, and his everyday attire is a casual take on Ivy League style. Where Elio wears band T-shirts and printed shorts, Oliver is more buttoned-up, favouring boxy, short-sleeve or rolled-up shirts in a variety of colourways, often with the tell-tale stitching of a polo player, further underpinning his heritage. He wears these with tidy cotton shorts, paired with a woven belt, or racy swimming trunks, while sporting Steve McQueen's signature Persols. The dusty feel of the film, matched with its effortless styling, has more than a whiff of The Talented Mr Ripley, and is well on its way to rivalling it as a seminal style piece.